The push to finish the construction of the Duncan Family Wing is getting underway, and for the most part the visible progress starts to happen on a smaller scale than it has thus far. now that the tower crane has been removed! One big exception to that statement was last month’s removal of the tower crane from the west side of the building. The task required the use of another giant, but mobile, crane to lift each piece of the tower crane up and over the new building, into the delivery driveway for additional disassembly, and finally onto several flatbed trucks to be carted back to the crane’s winter home in Florida, Arizona, or South Padre. 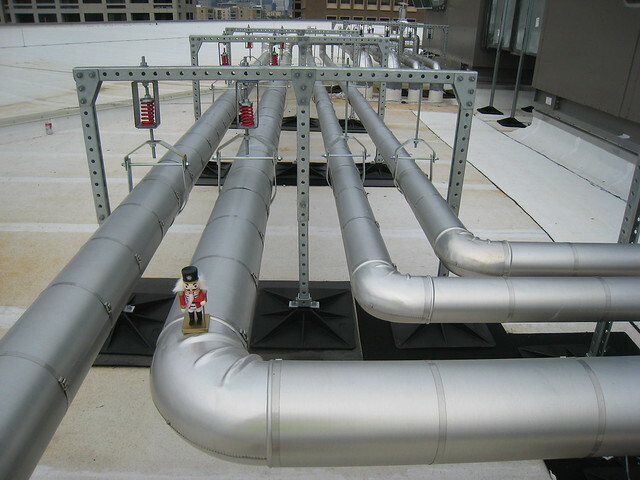 including these pipes taking water to and from the rooftop air handling units. 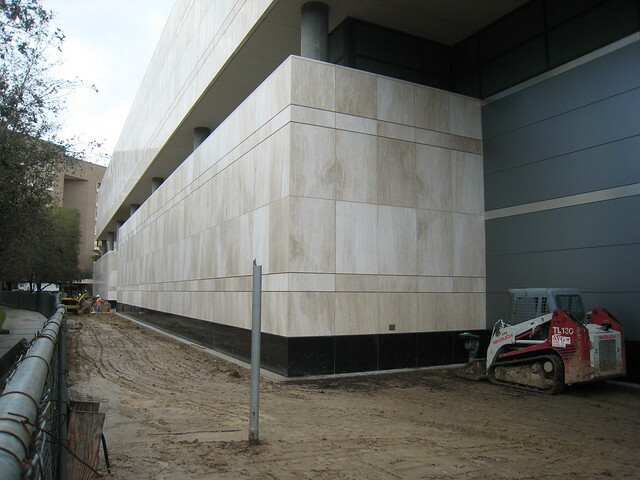 Throughout the rest of the building, final finish details are being completed. Mirrors have been hung in the restrooms. The stairwells are getting coats of warm gray paint. Door handles and light switch covers and illuminated exit signs are being installed. Sensors for lights, sink faucets, and toilet flush valves are functioning, albeit at times a bit over-sensitively. (I involuntarily flushed a toilet from a distance of five feet earlier this week.) All are going in now so the contractor can fine tune the details so they really shine when the building opens to the public. and maybe some Saturday Night Fever? 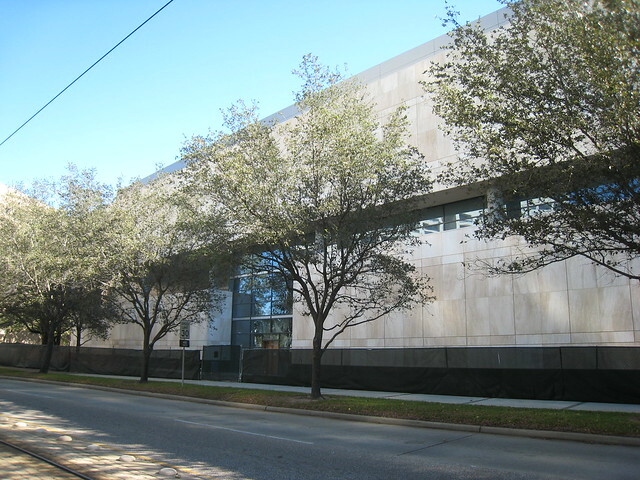 Much of the detail work this month is happening in the three areas where the new wing will connect with the existing museum at the Wiess Energy Hall, the Herzstein Hall of Special Exhibits, and the McGovern Hall of the Americas. 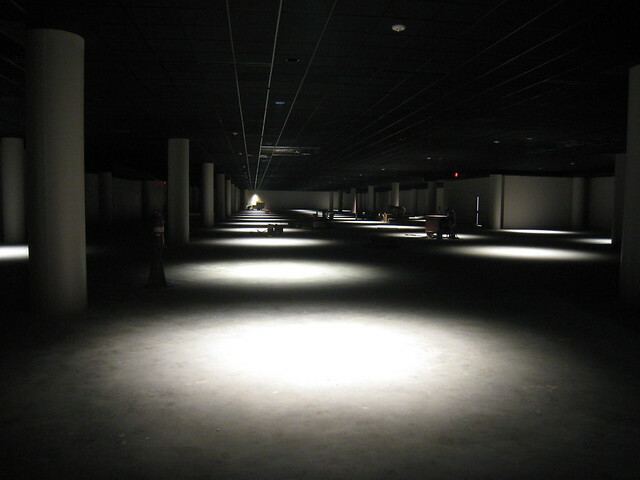 The finishes, meaning wall and ceiling materials and flooring even lighting, are a little bit different at each “tie-in” area because the spaces in both the new and old wing are a little bit different on each floor. The design team and contractor have worked to carefully coordinate the varying field conditions with distinct operational requirements to make each of the tie-in spaces both functional and beautiful. in anticipation of landscaping in the coming months. I can’t wait to share the finished product in the coming weeks. Be sure to check out this month’s flickr set for more details on the project’s recent progress. 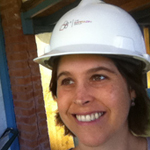 Susanna joined the HMNS Expansion project team in October 2009 as the museum’s representative during construction of the new wing, which is scheduled for completion in 2012. When she’s not laughing her head off at the comic stylings of the HMNS Building department (while trying to get some work done) Susanna is also principal of The Sarrazin Group, a real estate investment and management company, and is pursuing her MBA through the weekend program at the University of Chicago Booth School of Business. Follow the progress of the HMNS Expansion project through her monthly updates, which she hopes will make her as big an internet star as Zac. I love it. I wish there was an apartment included in the expansion for me to live in! What month will this open in the summer? Hi Steve! We haven’t announced the official opening date yet, but that information should be available soon. Next Post The Emancipation Proclamation is coming to a museum near you.